Add radiance to your life with the flow of natural energy from minerals and precious gemstones. The easy way to introduce mineral makeup into your daily routine, our naturally versatile collection can be used alone to enhance your true beauty and also works wonders alongside your existing beauty favourites. Infused with gemstones like rose quartz and amethyst, our blend of pure minerals actively energise and revitalise your complexion for healthy, glowing skin. Each collection has been carefully chosen with complementary shades to suit your specific skin tone. Ideal for all skin types, including very sensitive skin. 1 x Precise Mineral Kabuki Brush. IRRESISTIBLE FACE BASE: MICA, TITANIUM DIOXIDE, QUARTZ, AMETHYST POWDER. MAY CONTAIN (+/-) CI 77891, CI 77491, CI 77492, CI 77499, CI 77947, CI 77163, CI 19140. 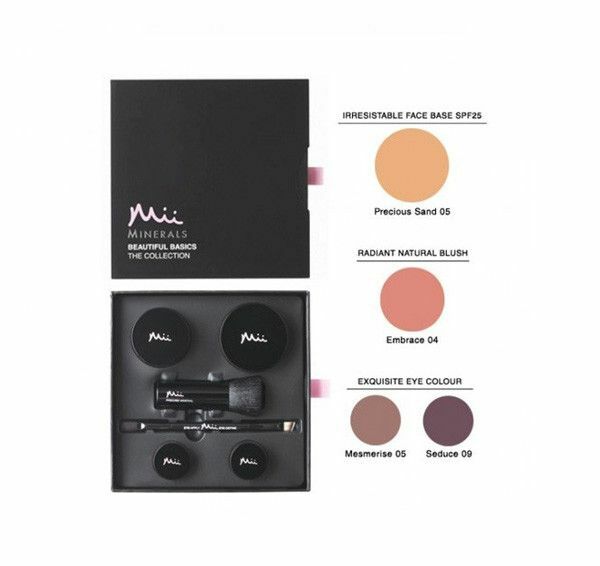 RADIANT NATURAL BLUSH: MICA, AMETHYST POWDER, CITRINE, TOURMALINE, SILICA.MAY CONTAIN (+/-) CI 77891, CI 77491, CI 77492, CI 77499, CI 77947, CI 77007, CI 77163, CI 77742. EXQUISITE EYE COLOUR: MICA, SILICA, AMETHYST POWDER, CITRINE, TOURMALINE. MAY CONTAIN CI 77891, CI 77491, CI 77492, CI 77499, CI 77007, CI 77163, CI 75470, CI 77742, CI 77510, CI 77288, CI 77289, CI 77947. Tags: Beautiful Basics Mineral Collection, Gift Set, Gifts, mineral collection, mineral starter kit, minerals, precious, present.